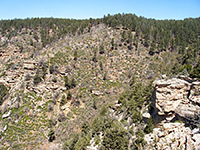 Like most footpaths on the North Rim of the Grand Canyon, the 5 mile Widforss Trail runs across the plateau rather than descending over the edge, passing close to the side of a deep, red-walled ravine (The Transept) for the first half then turning away through the forest before emerging into the open near Widforss Point. A large area of buttes and side canyons can be seen from this final overlook, centered on Haunted Canyon, a narrow tributary of Phantom Creek, although the views to the east are blocked by a thin promontory extending a little way further south. This is Widforss Point, beyond the end of the trail but accessible with quite a lot of effort by scrambling half a mile across a steep, overgrown ravine. The route to the main viewpoint is shaded and mostly level so not particularly challenging, though very pleasant; even the section through the woods, out of sight of any canyons, is scenic and enjoyable. Some might find the high elevation (around 8,000 feet) makes the walk more tiring that might otherwise be expected. 9 views of the Widforss Trail. The trail begins a little way along the unpaved track leading to Point Sublime, branching off the North Rim entrance road shortly before the main visitor complex, and just back from the much more frequented North Kaibab Trailhead. The track crosses a secluded grassy clearing in the forest (Harvey Meadow), often surrounded by melting snow drifts well into June, before reaching the Widforss parking area; past here, the surface becomes rougher as the road continues east for many miles towards several remote overlooks, also including Bedivere Point, Tiyo Point and Swamp Point. The first half of the Widforss Trail, as far as The Transept, is described in an NPS brochure (25¢) available at the trailhead, describing 14 numbered points of interest. The path is level for a way, across part of the meadow, before starting to climb a hillside into shady, mixed forest of pine, spruce, aspen, maple and fir. 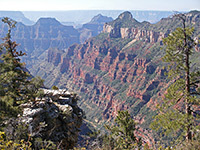 It winds in and out of a small ravine, the first of six such minor diversions, then approaches the canyon rim for the first time, allowing fleeting views of the tall Kaibab, Coconino and Redwall cliffs around the upper end of The Transept. As is the case for most overlooks along the trail, the views are always slightly obscured by trees - there is no sheer drop-off like at many South Rim viewpoints, just a marked steepening of the slope, so the tops of trees further down the hillside are in the line of sight. But the scenery does become gradually better and less obstructed as the path moves further west. The best vistas are between stops 11 to 13 (2 miles), near the far side of The Transept, from where all of the deep gorge is in view, and part of the larger Bright Angel Canyon in the distance. The high cliffs at either side block much sight of the main Grand Canyon, however. 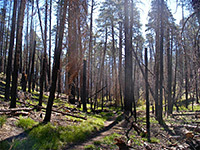 After the last numbered sign, the path turns away from the rim and descends a shallow valley, passing through light, airy woodland showing signs of recent wildfire damage. The edge of the canyon comes briefly close once more before the trail climbs to the top of a low plateau, completely surrounded by ponderosa pine and aspen forest, now rather more burnt by the fire. The place is peaceful, especially on clear, warm, windless mornings - conditions that often prevail in early summer. Wildflowers grow profusely in the sunny ground between the tree stumps, colorful birds flutter about, and larger animals like deer, coyote and the distinctive Kaibab squirrel may be glimpsed. The pure white bark and effervescent green leaves of the aspen trees as ever look especially striking against a deep blue sky. The path ends at a picnic area with table and chairs, in a clearing in the trees just before the land falls away steeply at the edge of the canyon. This tranquil spot has fine views south and partly west, though not east as that direction is hidden by the ridge leading to Widforss Point, a slightly higher and more isolated summit about half a mile away, separated from the end of the trail by a bushy ravine - the very upper end of Haunted Canyon, which is the main drainage to the south. This canyon is bordered by a narrow ridge at each side - on the left rise the prominent buttes of Manu Temple & Buddha Temple, and on the right is the wider span of The Colonnade, with Isis Temple further away and the cliffs of the South Rim beyond that, 9 miles distant. Widforss Point offers even better views (see 360 degree panorama), but the off-trail walk across a ravine filled with spiky bushes and up the steep limestone hillside beyond is rather difficult. Trail and point are named after Gunnar Widforss, a landscape artist who painted many scenes at the Grand Canyon early in the 20th century.